California Condor above Arizona’s Grand Canyon. Feather collection includes: Red-Shouldered Hawk, Red-Tailed Hawk, Blue Jay, Dove, Chicken, Parrot. 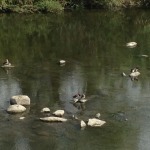 Mallards (probably) on the Los Angeles River. 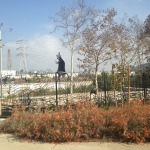 Great Egret along the Los Angeles River in Frogtown. 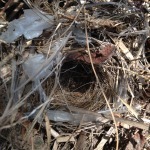 A nest made of grasses, leaves and plastic on an island in the Los Angeles River. 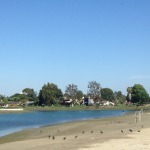 Mud hens along Colorado Lagoon in Long Beach, California. 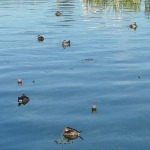 Ruddy Ducks in Colorado Lagoon, Long Beach, CA. Little Green Heron at the mud flats of Jack Dunster Reserve, Long Beach, CA. My grandma was a birder. I caught her enthusiasm for spotting and identifying our flying feathered friends on a trip to Sanibel Island in 1980. She introduced me to Great Blue Herons and Snowy Egrets, Ibis and Roseate Spoonbills. 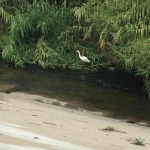 We saw Cormorants and Little Green Herons and Cattle Egrets. These most magnificent wading birds stood poised for us in the shallow waters of the J. Ding Darling National Wildlife Refuge. 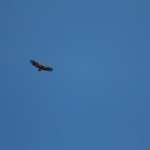 But none of them got her as excited as the Osprey we saw the next year. It nested outside our Collington Harbor cottage on the Outer Banks of North Carolina. It was 1981, I think. It was the first Osprey spotted in Nags Head since the pesticide DDT was banned in 1972. DDT had been broadcast sprayed in massive amounts from the 40s to try to control both insect-borne human diseases like malaria and typhoid, and tree diseases like Dutch Elm disease. 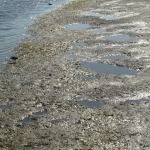 The spraying caused mass die-off of many insects and affected the food chain that ate the insects or contaminated soil. Shore birds that ate large amounts of fish carrying DDT produced eggs with thin shells that cracked in their nests. The effects were gruesome and widespread. The birds my grandma taught me were rarely in my consciousness. I never saw them. Not in Ohio or North Carolina where I was grew up. I remember the first Bald Eagle nesting on Jordan Lake outside Chapel Hill while I was in college. Everyone was excited about it. North Carolina went from zero in 1984 to over 100 nesting pairs of Bald Eagles in the past 30 years. The first time I remember seeing a Great Blue Heron other than Sanibel Island was after I moved to the Appalachian Mountains in 1992. My neighbor took us out to see the tragedy of a Heron wrapped around the wires bringing electricity to his house. We were as devastated to see its demise as excited to see one in our midst. The mountains were stuffed with species I hadn’t seen before. And not just birds. A Pileated Woodpecker flew regularly through the woods around our house. 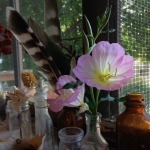 Tufted Titmouse, Black-Capped Chickadees, Purple Finches and Ruby-Throated Hummingbirds made daily appearances. But we also hosted little Southern Flying Squirrels, who ate the bird food off of our porch at night. The older I got the more of those great shore birds I saw. I chalked up their return to the diminishing presence of DDT in their environment. Ecology being the complex set of systems relationships that it is, there was much more to it than that. Here is a beautifully thorough timeline of the Eastern Bluebird from the 1700s until the present. Reducing environmental toxins, increasing protected habitat, and actively breeding threatened species to return to the wild have helped restore Bald Eagles, California Condors, Brown Pelicans, Peregrine Falcons, and Robins. 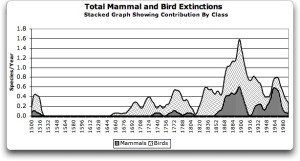 From the beginning of European settlement, humans have impacted birds directly: by hunting them for food, sport, or feathers for women’s hats; and indirectly: by destruction of habitat for development, changes to habitat by hunting other animals (the eradication of beavers from the 1600s on in North America completely changed our riparian ecosystems), or by introducing toxins. The banning of DDT was progress, but it didn’t change our ways. Other pesticides are still toxic. Plastics are finding their way into the nests and throats of birds and other animals. Fish eat microscopic plastic in our waterways, and birds and other mammals eat fish. We eat fish. We know toxic chemicals and plastics severely damage our ecosystems. 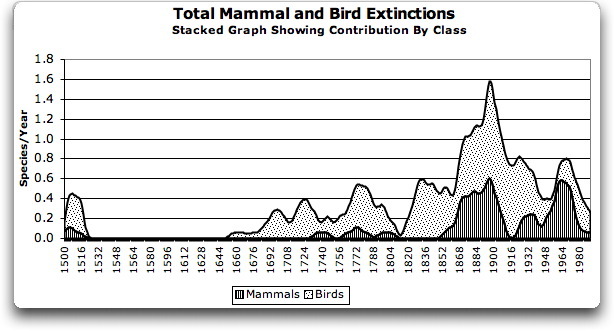 And yet we still allow their production and prevalence in the environment. Instead of relying on young geniuses like Boyan Slat to invent plastic clean-up machines, why don’t we prevent the pollution in the first place? Here are some good resources on the subjects of birds, plastic pollution prevention, and pesticide prevention.